Deepti Mukund’s dance studio in Potomac, MD, is turning into a “natya bhoomi” with talented dancers from India showcasing their dance prowess every now and then. 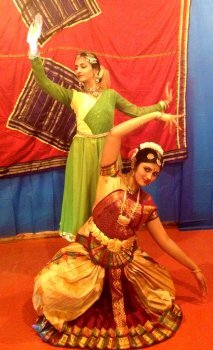 Nritya Sandhya, an evening of dance, took place on 23rd May. Shreya Navile started with a simple Alarippu to prepare the audience for an elaborate Kathak dance sequence by Chitra Arvind on “Shankara Mahadeva Deva” choreographed by the dancer herself. Kathak dancers are known for their partiality towards their ishta nishta Lord Krishna just like their Odissi counterparts. Therefore, it was quite a divine experience to watch a Kathak dancer perform beautifully a dance on Lord Shiva blending the lasya and tandava aspects along with the storytelling aspect of Kathak (Markandeya). Chitra's expertise in Bharatanatyam was evident in her animated facial expressions in all the dance sequences. The Shiva Stuti was in raga Puriyadhanashri and set to ek taal, sung in Dhrupad style. Chitra came into her own in Purandaradasa’s Dashaavatara in Ragamalika, where her delicate arm movements, intricate footwork with stomping of bare feet showed what a seasoned Kathak performer she is. The climax of the evening was “Ras Barse” in raag Yeman and Hamsadhwani and teen taal. Chitra, dressed in the traditional Mughal style, presented a bandish treated as a thumri portraying a virahotkandita nayika. 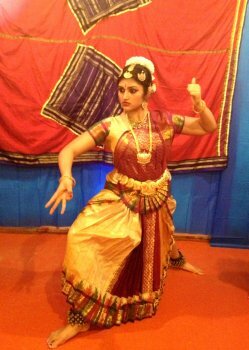 Here, Chitra charmed the audience with the head spinning chakkars and displaying the teen taal with her strong feet and superb abhinaya. It was delightful to see a Bharatanatyam dancer performing Kathak without compromising the integrity of the latter (Kathak). I must congratulate Chitra for performing in an informal setting as if she was performing before a jam packed audience in JCC and even changed costumes twice. She drove home an important point. You dance as if the gods are watching regardless of how many humans are present. In this evening’s informal recital, Shreya did more than her share – she was not just a “fill in the gap” performer. Shreya did full justice to my favorite Balamurali composition “Amma Anandadayini” choreographed by N Srikanth Natarajan. 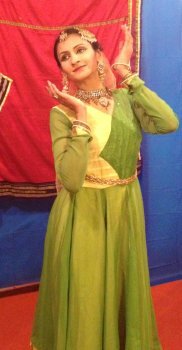 I saw Shreya perform this same dance during Natyabhoomi’s annual show in Oct 2012. Since then, Shreya has matured into a more sensitive artiste portraying strongly the nritta and abhinaya elements. In the javali “Muttavadu ra,” Shreya as Khandita nayika was surprisingly convincing. I was wondering how a fifteen year old (who has not yet experienced sringara rasa) could portray the emotions of a woman scorned so well. Her mother Deepti informed me that this dance was choreographed by Bragha Bessell. No wonder! When Shreya exited the stage gracefully with her face half covered, she reminded me very much of Bragha’s deer like exit. The concluding piece of the evening was a jugalbandhi performed by Chitra and Shreya where they performed dance movements in Kathak and Bharatanatyam, both distinct but exhibiting similarities in grace and beauty.